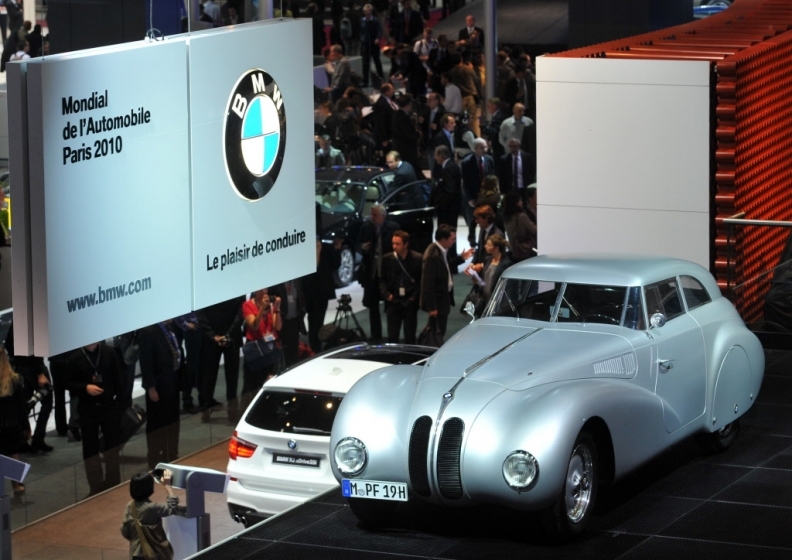 BMW to market new small car line in U.S.
A vintage BMW Mille Miglia automobile sits on display on the first press day of the Paris auto show. BMW plans a new front-wheel drive family of cars to be sold with 4-cylinder engines around the globe, including the U.S.
PARIS – BMW AG's new front-wheel-drive family of cars will be sold in the United States, as the German automaker is convinced luxury buyers are ready to accept vehicles smaller than the 1-series coupe. The new class is being called UKL -- an abbreviation for lower compact class cars sold in Germany. “It will be a relatively big segment because we have several body styles,” Ian Robertson, BMW AG's board member for sales and marketing, said in an interview today at the Paris auto show. He didn't disclose what body styles BMW is developing but confirmed the vehicles will have a four-cylinder engine in the United States at launch. The new family of small cars is expected to be introduced in the next few years – before the launch of BMW's megacity electric car due 2013, he said. According to media reports, BMW is planning at least three variants. Robertson expects significant volume from the small car lineup, with sales of 100,000 vehicles worldwide a year, he said. Robertson is convinced BMW can continue to command premium pricing on the front-wheel drive vehicles. “No one has said to me the Mini isn't great to drive,” Robertson said, referring to the BMW-owned British brand which is also front-wheel drive.